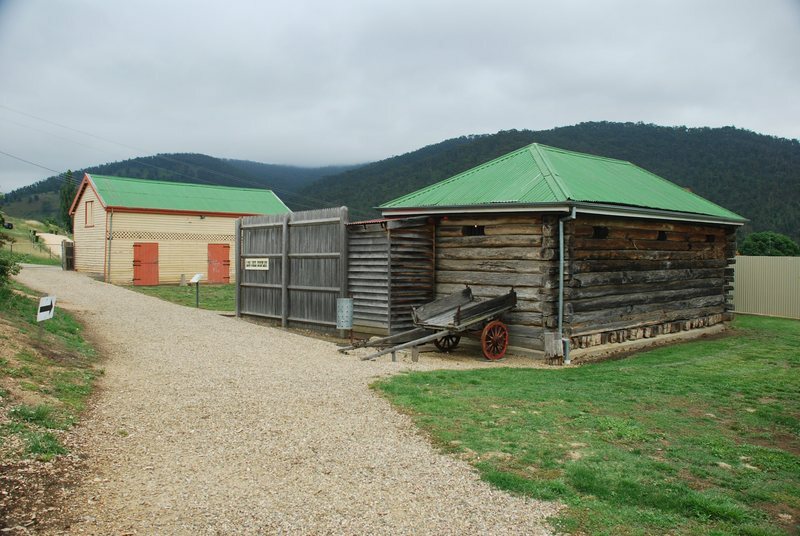 The Omeo Justice Precinct consists of a log lockup (1858) and stockade fencing (1985 replacing that of 1882-83), court house (1859-61), a police residence (1882-83), police stables (1882-83) and police cook house (1882-83), as well as the 1893 court house designed by the outstanding government architect A. J. Macdonald and the 1893 outbuilding containing toilets. The 1893 outbuilding is of contributory significance. The buildings which are not original to the site as a justice precinct, but were introduced to the site for the purposes of the Folk Museum, ie the Penders Court Laundry, the Blacksmithy and the Machinery Shed , are not part of the significance of the site. The Omeo Justice Precinct is architecturally and historically significant to the State of Victoria. The Omeo Justice Precinct is the most intact example of a nineteenth century police and court complex known to survive in Victoria. It is significant because of the presence of a number of elements which are architecturally and historically significant to the State. These are the Log Lockup/Gaol (1858), the Court House (1859-61), the Police Cookhouse (1882-83), the Police Residence (1882-83), the Police Stables (1882-83) and the Court House (1893). The Omeo Lockup is architecturally and historically significant as a rare example of primitive log construction in Victoria. It is unusual in retaining its internal log walling between cells and internal doors so that its original function can be clearly seen. 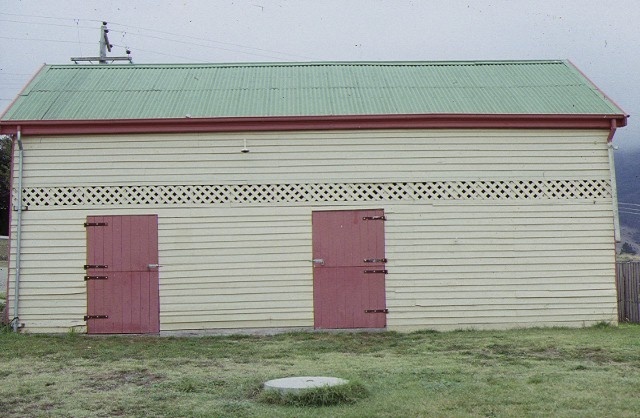 Although not the earliest, it is the most intact lockup in the State and in itself is of State significance as a rare example of a particular type of vernacular building construction seldom used in Victoria. It gains added significance in its context in a remarkably intact example of a nineteenth century justice precinct. The Court House (1859-61) is historically significant as a rare and intact example of a small country goldfields court of the 1850s. It was a symbol of the extension of the power of the State government to impose justice on a small and remote goldfields community and demonstrates in its fabric part of the story of Victoria. Its strong association with Arthur Currie Wills and Alfred Howitt, is clearly documented in Howitt?s papers describing the way he worked in the two small back rooms, and this gives it added historical significance. . The Police Cookhouse (1882-83) is historically significant as a rare example of a police building which demonstrates nineteenth century policing practices. 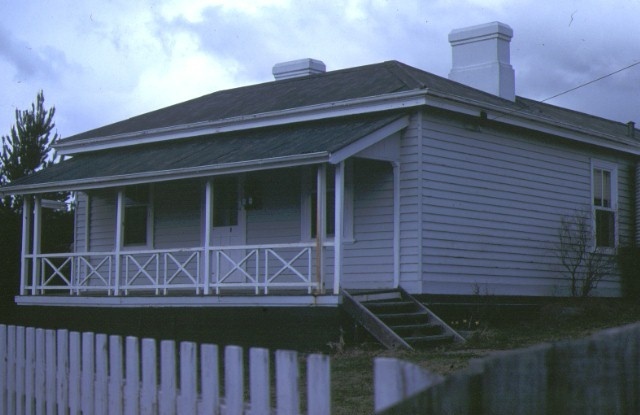 The Police Residence (1882-83) is historically significant as a representative and intact example of a nineteenth century timber police house and station which demonstrates the importance of the police presence in a remote mining town. The Police Stables (1882-83) is historically important as a representative and intact example of a timber stables, which demonstrates the way of life of nineteenth century police officers and their reliance on horses for transport. The 1893 Court House is architecturally significant as a fine and rare example of A. J. Macdonald's work, whose small but remarkable output for the Public Works Department during his brief architectural career was influenced by HH Richardson of Chicago and many other styles, such as the Arts and Craft Movement. The 1893 Omeo Court House is particularly significant as a rare example of a court house in the Federation Romanesque style in Victoria. 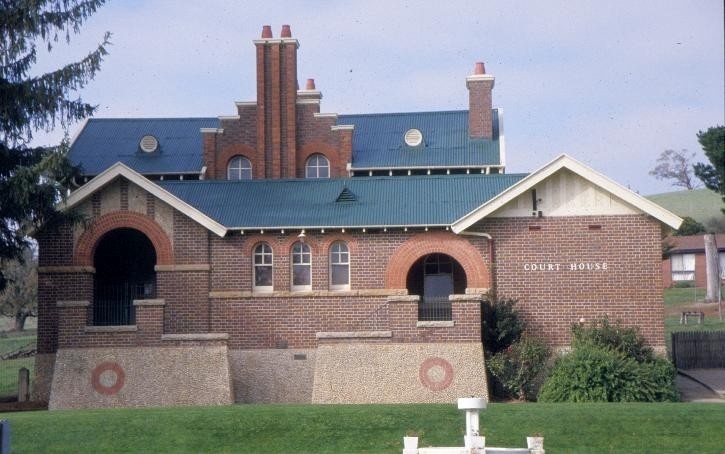 The Court House is also historically significant as an element within the justice precinct which is a rare and intact example of a complex of nineteenth century court and police buildings. Omeo Justice Precinct, Day Avenue, Omeo, East Gippsland Shire Council. 2. All the land marked L1 on Diagram 1536 held by the Executive Director being all the land included in Public Gardens Reserve and Public Purposes Reserve (Folk Museum) on Crown Allotment 1 Section D Township of Omeo Parish of Cobungra. Magistrate's chair in the court room. Set of 8 matching balloon back chairs in the jury box. Horseshoe back smoker's chair in the magistrate's room. The Omeo district was settled in the 1830s when land was taken up on leasehold on the Omeo Plains. The township of Omeo was settled in the 1850s when gold was discovered in the area. Miners began to arrive in large numbers during 1853 and some local residents, previously employed as overseers or stockmen set up businesses such as stores and hotels to serve their needs. Omeo's isolation attracted those who engaged in horse stealing or gold smuggling as it was remote and without a police presence but on the routes to a number of other places such as Beechworth, Bright, Albury, Eden and the Monaro. The first Police Magistrate, who also acted as Goldfields warden and Coroner, Arthur Currie Wills, arrived in 1858. He was assisted by Inspector Henry Hill, a sergeant, two mounted troopers and a foot constable. In an effort to raise the moral tone of the town, Wills held church services in the court house and started a library. A number of Chinese miners arrived in 1861 and there was considerable friction between them and the European population. Gold production was high in the 1850s and 1860s and mining remained important in the 1870s. During the 1870s, the Omeo Plains were opened up for selection, In 1885 Omeo was declared a township. The telegraph line was set up in 1881 but was not well maintained, By 1886 it was more reliable and a daily coach ran from Sale. , The discovery of the Glen Wills and Upper Gibbo gold fields extended the mining era and reef mining was carried out until the 1920s. The gold discoveries provided the reason for an expanded police and justice complex in Omeo in the 1880s to serve a remote and turbulent mining population. 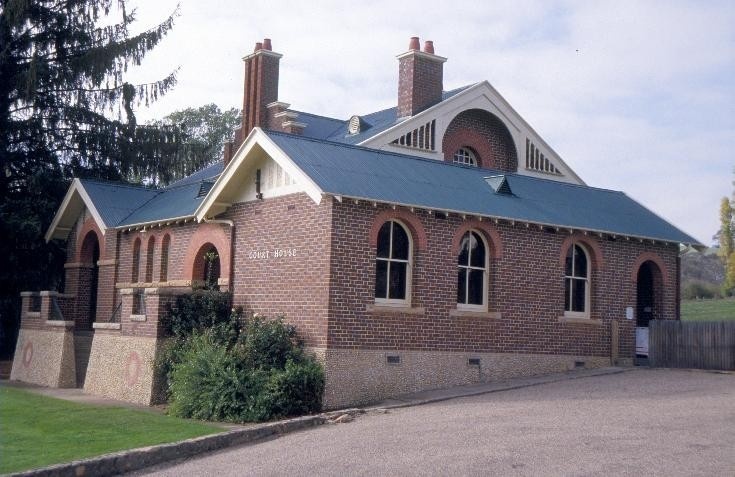 The gold discoveries also provided the prosperity which made possible the building of the Omeo Post Office in 1890 and the second Omeo Court House in 1893. The log lockup was built in 1858 when the newly appointed police magistrate Arthur Currie Wills was sent to Omeo. He engaged Mssrs Roy and Dalrymple to build a secure gaol and they hired local handyman and miner Buff Donald to cart the logs and help build the structure. According to local tradition, Donald drank so much to celebrate the completion of the lockup that he was the first person to spend a night in it. The Omeo lockup was one of three constructed in 1858 to hold prisoners being taken to Sale for trial. The others were at Tongio and Tambo Crossing but these are no longer extant. The lockup was unlined but the logs shrank, leaving gaps so that items could be passed in to the prisoners. Repairs were made to the gaol in 1863 at a cost of £205. This probably included the lining of the internal walls and ceiling with split timber to improve security. Prisoners were held for up to three months in the gaol at Omeo though longer term prisoners appear to have been transferred to Sale or Beechworth. . For instance, Yong Ah Sein was sentenced to 3 months with hard labor in Omeo gaol in 1865. The smaller central cell is believed to have been used to hold female prisoners. Women were held at Omeo until their case was heard but then appear to have been transferred to other gaols to serve their sentences . The building was re-roofed in galvanised iron in 1882-83 but the original shingles are believed to be still underneath the iron. In 1882-83 when the police residence was constructed, the Public Works Department plans of that date show that an exercise yard and sentry platform was constructed around the log gaol, and a cook house placed at the north end and an earth closet at the south. The closet is still in the same position at the south end of the Lockup/Gaol, though it has no door. In 1985, the gaol was dismantled so as to allow a concrete floor to be laid and then re-erected on the concrete base. It is not known how much of the fabric is original: some of the lower logs have had to be replaced. The exercise yard fence and the elevated sentry platform fell into disrepair and were re-constructed by a community group in 1985. The only original fabric retained in the fence is the iron bolt on the gate. The log gaol was used as a lockup until 1980. Horizontal log construction was seldom used in Australia although very common in North American settler societies. 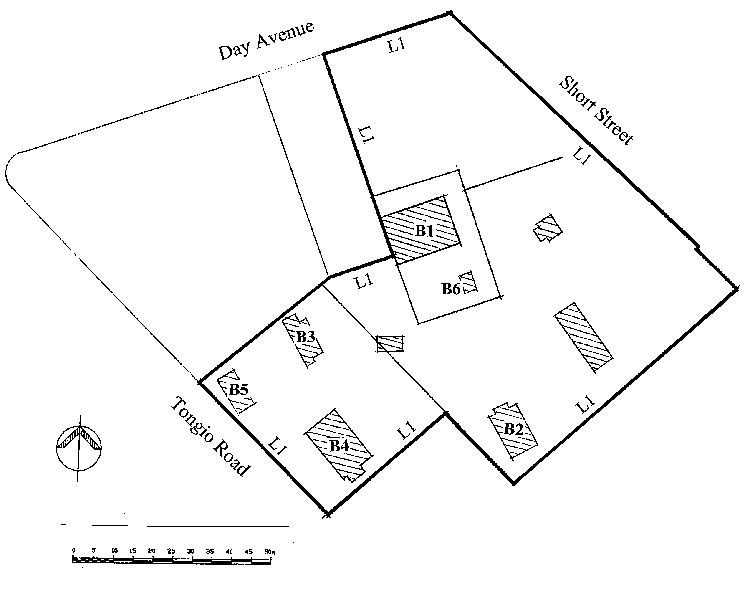 Early timber vernacular construction in New South Wales and Van Diemen?s Land. tended to be according to the English half-timbered tradition. Log construction was brought to Victoria at the time of the gold discoveries by North American migrants but was not widely used. Miles Lewis in Victorian Primitive notes that horizontal log construction was not common in Victoria but ?was adopted by the police as the best method of building secure lockups in country areas where brick or stone was not a possibility but timber was at hand.? The Court House was constructed between 1859 and 1861. Gold was discovered at Omeo in 1852 but it was not until 1858 that police were sent there to establish law and order. In 1858, the first resident Police Magistrate, Arthur Currie Wills, was appointed and the following year, tenders were called for a court house. Construction work at Omeo, in the far east of the state and accessible only by rugged mountain tracks, was evidently not sought after, since two contractors failed to follow up their tenders. Finally P. Macarthur's tender for £432.10.0 was accepted and the small brick court house with shingled roof was completed. The historic significance of the Omeo Court House comes from its association with early police magistrates, Arthur Currie Wills and Alfred Howitt. Wills had the difficult task of bringing law and order to the remote Omeo district for the first time.. Howitt, born in Manchester in 1832, migrated to Australia in 1852 and spent some time on the goldfields. In 1859, he was appointed to lead an expedition to determine the pastoral potential of the Lake Eyre district. In 1861, he was chosen to lead the party to relieve the Burke and Wills expedition, and returned to Melbourne a hero. He used his success to gain his appointment as a police magistrate and warden and was sent to Omeo in 1863. When he first arrived at Omeo, Howitt lived in the two rooms at the back of the court house. Alfred Howitt left an account of his days at Omeo in his letters home to England.. He used his time at Omeo to study his surroundings and record his observations. .In the fields of geology, botany and anthropology, he made significant contributions to contemporary knowledge about Australia. As the Omeo goldfields became less productive, and the population dropped, the legal centre of the area was moved to Bairnsdale, where Howitt and his family moved in 1866. Omeo no longer had a resident magistrate but was visited regularly from Bairnsdale by Howitt as part of his circuit. Omeo Court House is representative of the first large group of court houses built after the Separation of Victoria from New South Wales in 1851 and the granting of responsible government to the colony of Victoria in 1855. These were mainly small buildings to house Courts of Petty Sessions in goldmining areas of Victoria and were built in response to democratic pressures for access to local justice. It illustrates the process of law and order imposed on a remote goldmining settlement without other government representation. The resurgence of the Omeo goldfields in the early 1880s was responsible for an increased need for police protection in the Omeo community. The contract for a new police station was let in 1882-83 for £1187.7.0 to contractor William Johns. This included a large police residence which consisted of a messroom and office, living room, three bedrooms and kitchen. The contract included the cookhouse and the exercise yard for the existing log gaol and probably the stables. It is probable that the stables were constructed at the same time as the police residence in 1882-83. The contract was for £1187.7.0 which was a larger sum than was usual for police residence on its own. 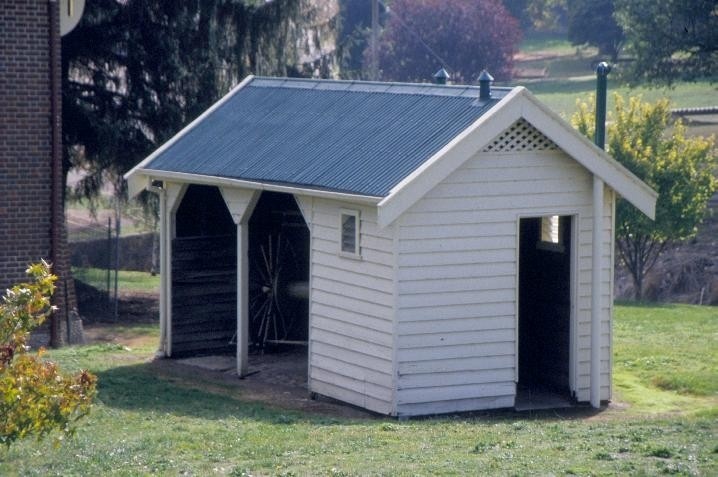 .Quite large numbers of timber stables were constructed at police stations around Victoria. These were mainly built between 1875 and 1909:it was not until 1922 that the Victorian police started to use motor-cars for traffic and patrol work. Most police stables were constructed in the 1880s. They were generally of standard design, rectangular in form with gable roof clad in galvanised iron, timber framed walls and had latticework panels for ventilation. They were paved with timber blocks or in brick. Most included a forage store and had stalls for one, two or three horses. The timber police cookhouse or kitchen was constructed in 1882-83 when the police residence was built. It would have replaced an earlier cookhouse on the site. From the evidence of the extant architectural plans, it seems that the cookhouse was built in 1882-83 as part of the work on the Omeo police station. Before the 1870s, when policing required large numbers of single men to cover large distances, a police camp which included a central cookhouse to cater for police and prisoners was common. From the 1870s when permanent police stations were built to house a policeman and his family, it was common for the policeman?s wife to cook from her own kitchen in the sergeant?s residence for the one or two men living in the single men?s quarters on the police reserve.. The cookhouse at Omeo is therefore a rare example of a building which demonstrates a vanished way of life. Its late date of construction may be explained by the particular circumstances at Omeo which was a remote goldmining area in the 1880s. It is unusual to find a separate cookhouse within a police complex as late as 1882-83, particularly when the police residence had its own attached kitchen. 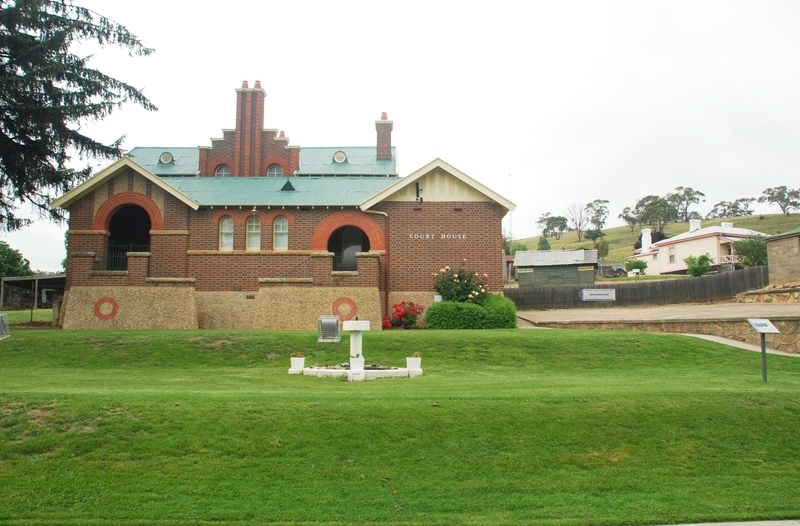 Its presence suggests that the Omeo gaol was usually fully occupied at that time. Macdonald moved from the Public Works Department to the Law Department in 1898 where he became Examiner of Patents. In April 1904 he transferred to the Commonwealth Public Service, where he took up the position of Australia's Examiner of Patents within the Department of Customs and Excise. In 1912, Macdonald entered the competition for the design of the Australian Federal Capital, His was one of eight designs short listed in the competition from a field of one hundred and fifty entries. His scheme was arranged around a large irregular lake in the valley of the Molongo. Most of the streets were arranged at 45 degrees to the meridian, which he believed would allow all parts of the buildings to be bathed in sunlight at some stage during the day. His entry was discarded because it was not based on a radial planning system. Macdonald later worked for some time in Walter Burley Griffin's Melbourne office as his Chief Assistant. In 1920 Macdonald proposed a scheme for a new Civic Centre for Melbourne on the present Arts Centre site. He retired from the Commonwealth Public Service in 1929. He died at home in Elsternwick on 16 September 1951, aged 87.
external form of the building. The style of the single storey building is the Federation Romanesque, used in Australia between approximately 1890 and 1915, and is one of the earliest buildings to show the influence of the American Romanesque (Richardsonian) style in Australia. This style features asymmetric planning, prominent gables, semi-circular openings and tall chimneys and the exterior expression of the internal plan. The building is intended to be seen from all sides: each aspect provides a different view. A small timber outbuilding was constructed at the same time as the court house in 1893 . It contained toilets for the public and an area for the magistrate?s buggy. The Omeo Justice Precinct is historically important as an example of an intact complex of police and court buildings illustrative of the way in which justice was administered in a gold mining community in the nineteenth and twentieth century. The Omeo Justice Precinct is the most intact example of a nineteenth century police and court complex known to survive in Victoria. The Omeo Justice Precinct is important in exhibiting the principal characteristics of a nineteenth century police and justice complex. The Omeo Justice Precinct includes a fine and rare example, in the Omeo Court House of 1893, of the work of the prominent Public Works Department architect A. J. Macdonald who was one of the earliest and most talented exponents of the Federation Romanesque style in Australia. The Omeo Justice Precinct (and particularly the Court House of 1859-61) is strongly associated with the first Police Magistrate and Warden for Omeo, Arthur Currie Wills (1853-1862), whose presence on the goldfield represented the force of justice and the colonial administration. The Omeo Justice Precinct (and particularly the Court House of 1859-61) is strongly associated with the second Police Magistrate, Alfred Howitt (resident magistrate 1863-66, visiting magistrate 1867-84), whose scientific research and observation undertaken during this period and later, contributed to Australian anthropology, geology and botany, earning him an international reputation. His early writings on his life as a police magistrate at Omeo give particular significance to this Court House. The buildings which are not original to the site as a justice precinct but were introduced to the site for the purposes of the Folk Museum , i.e. the Penders Court Laundry, the Blacksmithy and the Machinery Shed , may be removed to another site.